A My Health Record has been created for every person with a Medicare or Department of Veterans’ Affairs card, unless you have chosen not to have one. Legislation has been passed where Australians can opt in or opt out of My Health Record at any time in their life. Having a My Health Record means important health information – including allergies, medical conditions and treatments, medicine details and scan reports – can be accessed through one system. My Health Record allows patients to take more control of their own health and wellbeing, manage their children’s health, and upload key documents such as advance care directives. NSW Health clinicians can access information about a patient's recent health history from all NSW LHDs and the My Health Record, via HealtheNet. 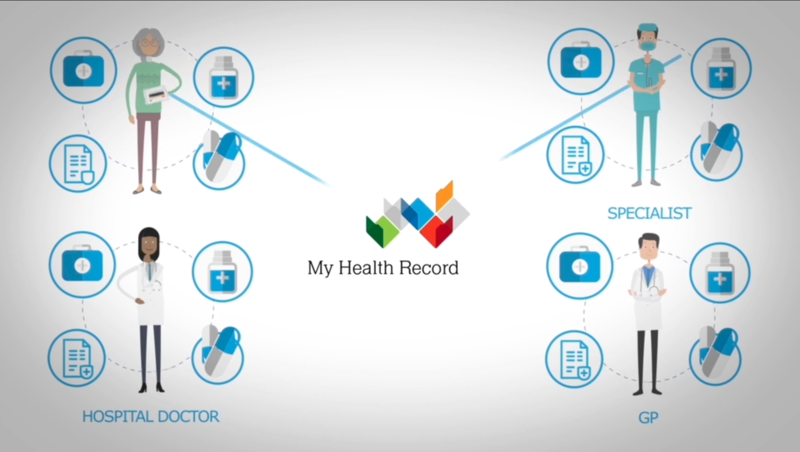 The My Health Record is an online summary of your health information. You control what goes into your My Health Record and who has access to it. Information in your My Health Record may include: allergies, medical conditions, treatments, and medicine details. The My Health Record allows you to share your health information, with doctors, nurses and other healthcare providers as part of your care. How do I find out more information about the My Health Record? You can visit the My Health Record website: https://www.myhealthrecord.gov.au/ or contact the helpline on 1800 723 471. You can read the 'Health Information Privacy Leaflet for Patients' here. If I attend a NSW Health hospital and I have a My Health Record, what information will I see in My Health Record? When you visit a NSW Health hospital or health service, information about your care is recorded in a secure electronic medical record. Discharge summaries, pathology test results, discharge dispense medication and diagnostic imaging reports will be sent to your My Health Record. This will happen unless you choose not to have this information sent to your My Health Record. If I visit a NSW Health Hospital and have a My Health Record what information can my healthcare team see? The healthcare team involved in your care will be able to view your My Health Record via NSW Health’s HealtheNet Clinical Portal. In accordance with your My Health Record access controls, your healthcare team can see information uploaded by healthcare providers, including your GP.